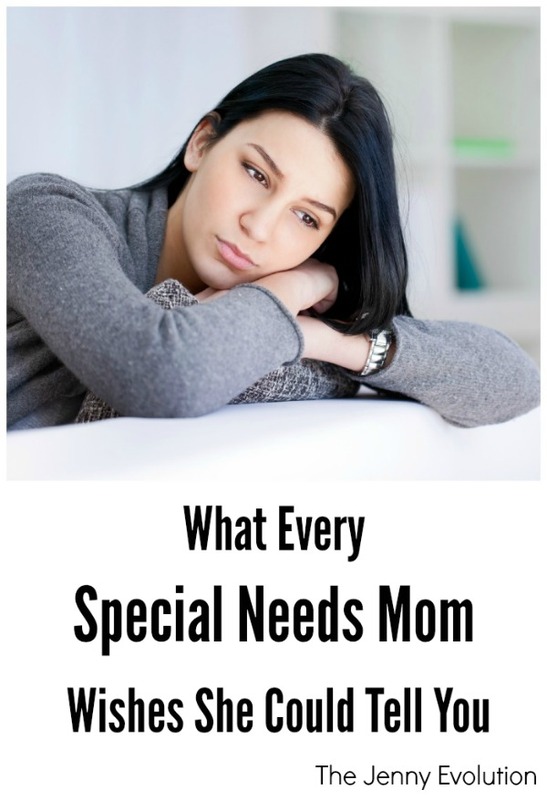 As the parent of a kid with a number of special needs, it’s tough to not have many people around us who understand that while we may seem like just an ordinary family, there’s a lot more going on in the background that no one sees. Some days I still feel alone… Even with great friends. Even with an amazing online community. Some days I still feel like no one understands. Even though I know there are other moms out there facing the same thing. Some days I just wish I had a friend down the street that instantly understood what I was taking about. I know you’re trying to get it… but unless you’re living it day to day, you can’t. Some days I wish I had fellow moms who, with just a glance, would know exactly what I was thinking/feeling/wishing. Some days I wish I had nearby friends where I didn’t need to say anything, explain anything. We could just sit in silence and just know….. Know what Sensory Processing Disorder means. Know what ADHD means. Know what Dyslexia means. Know what I mean on a daily basis, yearly basis and need-to-know basis. Some days I seem really strong, but I’m not. Some days I seem happy/normal/fine. I’m not. I cry when you’re not looking. But the day passes and a new day comes. I take a deep breath and embrace all of the amazing and wonderful things in my life. I see how far my kids have come. I see all that I have learned. I see how I am lucky in so many ways. But there are still some days…. If you’ve ever felt like this, remember that someone else out there is feeling like it’s some day, too. Click to read more of my posts touching on Sensory Processing Disorder.To learn more about sensory challenges or to join our inclusive community, visit The Sensory Spectrum. I’m here; WE are here (thanks to you! )…but I sure know what you mean. Sending hugs your way! Thanks for creating this online community of support. It helps more than you know, but I understand. It sure helps to have people in our daily lives who truly “get it”. There are two ladies in my area who have formed a SPD support group, and we have monthly meetings. It’s nice to connect with people in the real world. Perhaps you could start one in your town? I feel like I spend so much energy during the day trying to keep mine regulated, help deal with emotions, trying to see ahead of time what could cause problems…. And even though I am not alone, and I know it could be worse, there are days I just feel like it’s all I can do to keep going. Yes! I spend a lot of time figuring out what could cause problems just so we don’t go down that rabbit’s hole of meltdowns. I don’t know where I’d be without my online community of support! Taking deep breaths with you, thanks for gathering us on this blog hop, it means a lot. Robin — Happy you’re part of our community 🙂 I just wanted people to know that we ALL have those days. I think many moms can relate to this feeling of isolation. Even as a child therapist, when my toddler wouldn’t eat and was slowly starving herself to death – I felt very alone. Thanks for helping support and educate people about sensory issues. I hear you girlfriend! These are the exact thoughts I have every day. Some days I just wish a friend would surprise me with a bottle of wine and sit down with me, not judging my home in its post – meltdown state. Some days I can tangibly see the support of my family and friends and strangers online, but I still sit down and feel utterly alone. You’re definitely not crazy. And you’re definitely not the only feeling like this. I understand how people come over just the way the house is. We had kids and mom come over after the last day of school… I didn’t bother putting anything away. Just too much effort and people may as well see how things are. Not a judgmental side glance in sight — the sign of true friends. Thank you! It’s something we all feel and think… but sometimes it just needs to be said. Thank you so much!! I’ve got a 15 year old with dyslexia, sensory processing issues, and what I think is adhd and aspergers all throw in together. Life can just be that little bit complicated with her and it is so nice to hear you say what I feel regularly. The nice thing is I am realizing that there are people all over the world who are having a day I am having, it’s like a silent friendship with someone I haven’t even met yet. I love the way you describe it — a silent friendship. That’s certainly the love I’ve felt from this community… knowing that it’s not just me being dramatic or not being able to handle parenting. There’s something more going on and there are other moms out there that totally get it. One with ODD, and one with ADHD, SPD, emotional issues, and has now announced that he is gay. I myself am just getting over Breast Cancer, and my husband who was unemployed for year, has just started a job 100 miles away. It is a lot. And I am having a day. Thanks for talking about it.